A month or so ago I picked up a pair of soft denim shorts for Emma (for $5, such a bargain!) 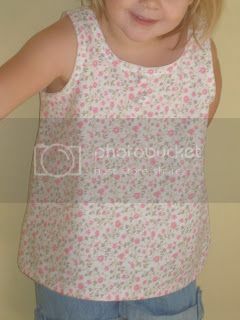 and had been mulling over a top to make when I found this tutorial at Prudent Baby. The instructions for making a basic top from something already in your wardrobe were easy to follow, and I think the top turned out really well! I've had this fabric for while, another gift from Mum. But I was never completely sold on it, and was really unsure as to what I'd use it for. Now that I see it made up for Emma I think it's perfect - very girly and feminine. I had thought I'd put a ruffle down the middle, or as in the tutorial a white rectangle and sew the buttons on top (kind of like a bib), but sometimes simple is best right? Two covered buttons and it's so sweet, I didn't want to complicate it.